These beautiful women's leather gloves for wheelchair users were designed by a designed2enable wheelchair user who knows how hard it is to find a good-looking wheelchair glove. These stylish finger-less gloves are perfect for shopping, around town and special occasions. Each pair of wheelchair gloves is hand-made in the UK using Hair Sheep leather from Africa which offers a perfect pelt for gloves. The Hair Sheep is bred for meat and the leather used as a bi-product. The gloves offer a neoprene padded palm and thumb piece and a luxury soft leather feel. The fully adjustable Velcro strap and trim are detailed in a contrasting colour from the rest of the glove, to offer added interest and styling. Although our gloves are made from a soft leather, they are surprisingly hard wearing due to the quality of the Hair Sheep leather. We recommend spraying them with a leather protector prior to using them. If they get really dirty, it is possible to clean then by rinsing them very gently in warm water and then leaving to dry in an airing cupboard but do not wring them out or put them on direct heat (e.g. a radiator). 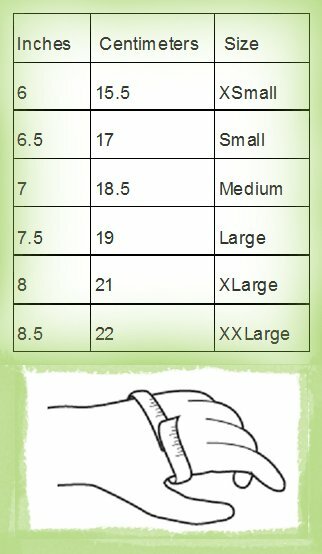 We are currently holding stock for ladies Medium, Large and XLarge wheelchair gloves and are taking orders for other sizes. Please email us via our contact page with your requirements. Please note that due to each pair of gloves being handmade, orders may take up to 6 weeks for delivery but in most cases we will fulfill your order much sooner. We are also able to supply wheelchair gloves for men upon request. Delivery within 6 weeks but often much sooner. "I received my new wheelchair gloves today. They are to use a much used phrase 'Absolutely Fabulous'. The leather of the gloves is as soft and buttery as a high end leather gloves. They will wear in really well. There is a decent pad on the underside to give added protection but it's not bulky in anyway. The contrast colour is an added level of style to finish the look. It's so nice to have some gloves that will be useful and fashionable too, I can't wait to try them out in Italy when we go later this year, I would be proud to hold them up against Italian chic!"